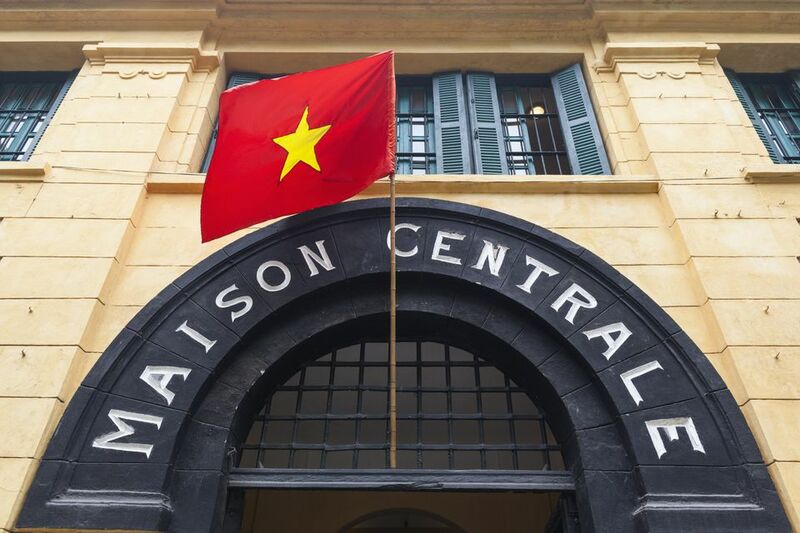 Hoa Lo Prison, more popularly known as the "Hanoi Hilton", is a museum near the French Quarter of Hanoi, Vietnam. 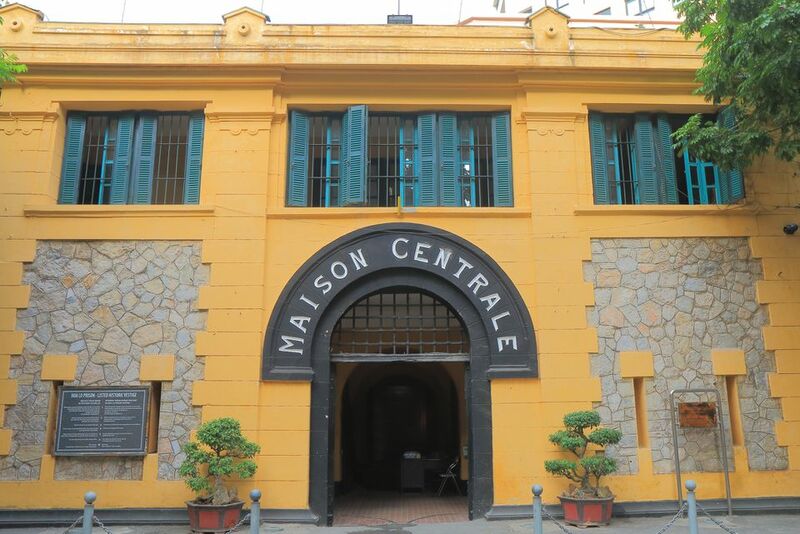 It was first built in the late 1890s by Vietnam's French colonizers as a central prison (Maison Centrale) for Vietnamese criminals. As mastery of North Vietnam passed over from the French to the Japanese to the Vietnamese Communists, the prisoners changed as well – Vietnamese Communists imprisoned by the fearful French authorities gave way to American prisoners of war (POWs) taken during the Vietnam War. If you were expecting a faithfully-told account of American POW life in Hanoi Hilton, though, you'll be very disappointed by the exhibit – history is written by the victors, after all, and the story they tell here is that of the heroic Vietnamese communists who were imprisoned, tortured, and executed by the French and Japanese occupiers. For other ways of getting your fill of fear: read about other creepy museums in Southeast Asia. Hoa Lo Prison is most easily accessible by taxi; 1 Pho Hoa Lo is right at the corner of Pho Ha Ba Trung, south of Hoan Kiem Lake on the lip of the French Quarter (Google Maps). Read about transportation in Hanoi. The Prison occupies the length of Pho Hoa Lo, which runs from Pho Hai Ba Trung to Pho Tho Nhuom. Only its southern end remains – the rest was swallowed up by the Hanoi Towers complex in the 1990s. To get in, you'll need to pay an entrance fee of VND 30,000 (about US$1.30) at the gate, but a color brochure will be provided to you upon payment. (Read about money in Vietnam.) Photography is permitted. Upon entering the gate and paying the entrance fee, you will be guided to a long building on your immediate right. The first room you enter features a display showing the Phu Kanh village which once stood on the Hoa Lo Prison site. The village traded mainly in the manufacture and sale of ceramic houseware, which gave the street its name -- "Hoa Lo" directly translates to "stove" or "fiery furnace", which were all over the village churning out household pottery products day and night. The first room displays old pottery and kilns typical of the area before the French razed the town to make way for the Hoa Lo Prison. About four dozen households were moved in the process. The second room in the building displays a diorama of Hoa Lo Prison back in its heyday, along with a large iron gate that looms over the room. The gate used to stand at the "mouth of the monster" (the front door through which visitors troop through to enter Hoa Lo Prison); today, this massive steel hulk is the main attraction in a room that introduces visitors to the cruelty and horror experienced by prisoners in Hoa Lo. The "E" stockade is a long room with life-size models of Vietnamese prisoners shackled in two rows, with the latrine on one end of the room. As one can imagine from the picture, life as a political prisoner in Hoa Lo was no picnic. Most inmates lived together in the communal dormitory, typically the largest edifice in the prison compound. There, all the prisoners lay side by side, on elevated concrete platforms that ran along the walls. Embedded at the foot of these platforms were rows of iron rings, through which a metal bar, known as the barre de justice, was threaded. To prevent them from moving around freely in the open chamber, prisoners slept with their ankles shackled to the barre. The shackles could not prevent prisoners from fraternizing, of course. Zinoman quotes a former inmate, who recalled his time in prison with a sense of nostalgia. "Despite being immobilized by the chains around our feet, we were glad because we were next to each other and could share happy and sad memories," said the inmate. Off to the side you’ll see a cachot, or dungeon, where dangerous or suicidal prisoners were kept in solitary confinement. In each narrow cell, a prisoner was shackled to the concrete floor, and the area was kept under tight guard. Once you exit the solitary area, you will walk down a long outdoor corridor where several memorials to Vietnamese prisoners stand, including a sewer through which five Vietnamese death-row inmates escaped on Christmas Eve in 1951. Hoa Lo was never "escape proof" despite its fearsome reputation – several successful jailbreaks were recorded throughout the prison's long history. Prisoners once managed to walk right out of the prison door; in the confused transition between French and Japanese authority at the close of World War II, some prisoners simply changed out of their prison clothes and casually made their escape. After crossing the length of the corridor, you will pass by the quarters for female prisoners, before entering a gallery of cruelty perpetrated by the French colonizers. Female prisoners weren't spared from the harsh regime of the prison – Zinoman quotes from a report made by a certain M. Chastenet de Géry on the female quarter's inhumane conditions. The female quarter exhibits from a hygienic and moral point of view and from the standpoint of simple humanity a truly revolting picture. In an area built for 100 prisoners maximum, 225 of these miserable creatures are locked up. Neither classed nor categorized, they form an indescribable mob; political prisoners, common-law prisoners, juvenile delinquents, and twelve mothers, together with their infants. The death row dungeon stands immediately after the female quarter -- in this room, the crimes of the French colonial administrators are laid out in painstaking detail. A guillotine stands against one wall to underscore the gruesome executions that took place here; a vintage photograph of three guillotined heads is posted next to it. This particular guillotine was portable – its personal best was known to have taken place at Yen Bai Prison, where eleven members of a nationalist group died by its blade. The next stop lies in the largest outdoor area in Hoa Lo Prison: a memorial monument to the honored dead of the Vietnamese revolutionary movement. To Americans, this monument may present a jarring disconnect – after all, weren't we raised to believe the "Hanoi Hilton" was a symbol of oppression? But Hoa Lo Prison casts a different shadow on Vietnamese history – under the French, the prison was a crucible for revolution, and those who died in its unspeakable conditions are regarded today by the Vietnamese as martyrs. The American POW experience in Hoa Lo, which we will see next, merits but a small footnote in the history of the prison, and the history of Vietnam at large. The American POW experience in the "Hanoi Hilton" during the Vietnam War is entirely played out in the "blue room", also known as the pilot exhibit. The two galleries in the pilot exhibit show a highly sanitized view of POW life in Hanoi's Hoa Lo Prison. One gallery chronicles the harm visited upon Vietnam by American planes and attempts to justify the imprisonment of the hundreds of American POWs, pilots who were shot down over North Vietnam and imprisoned in Vietnamese jails like Hoa Lo. Arizona Senator John McCain plays a prominent part in this exhibit, as his captured flight suit stands at one end of the gallery and his personal effects are scattered throughout the exhibit. The second gallery purports to show average POW life in Hoa Lo, with pictures of clean-shaven and healthy American soldiers creating a rather glowing image of prison life. A church-like nave with a cross and images of POWs at prayer and preparing Christmas dinner gives the impression of unfettered religious freedom. The images in this gallery are diametrically opposite of the accounts given by returning POWs like McCain and Robinson Risner; we see the Vietnamese government view of life in Hoa Lo, but nothing at all of the POWs' point of view. The last stop in the Hoa Lo tour is the shrine at the second floor, with a couple of rooms that serve as a memorial to the survivors of Hoa Lo Prison. The names of notable Hoa Lo prisoners are commemorated on brass plaques on the wall. The room showcases their personal effects (including a large jury-rigged Vietnamese flag) and memorializes the Communist Party cell that was founded within Hoa Lo Prison's walls. When I was in Laos, I agitated secretly but I had no idea what communism was. Only after I was imprisoned in Hoa Lo and had the opportunity to read books and study did I understand the correct way of communist struggle. When I think back to the months in Hoa Lo, the time seems so precious. It is only thanks to my months in Hoa Lo that I know something of revolutionary theory.